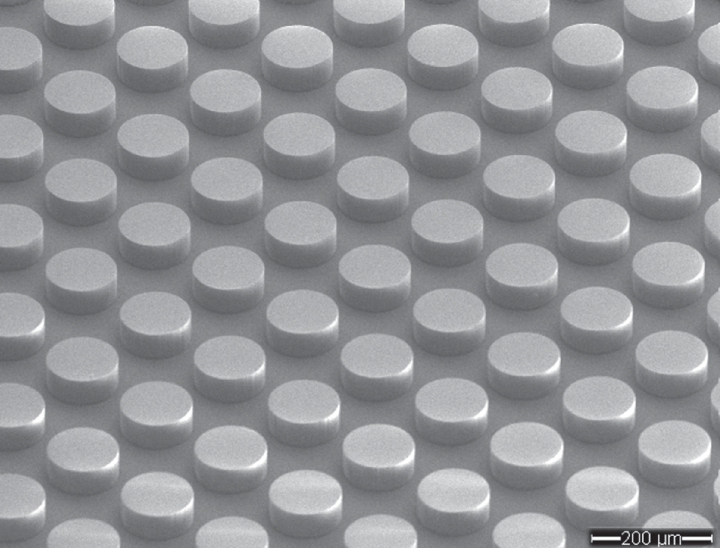 In a new paper, electrical engineers at Duke University demonstrate the first completely dielectric (non-metal) electromagnetic metamaterial—a surface dimpled with cylinders like the face of a Lego brick that is designed to absorb terahertz waves. While this specific frequency range sits between infrared waves and microwaves, the approach should be applicable for almost any frequency of the electromagnetic spectrum. The results appeared online on Jan. 9 in the journal Optics Express. "People have created these types of devices before, but previous attempts with dielectrics have always been paired with at least some metal," said Willie Padilla, professor of electrical and computer engineering at Duke University. "We still need to optimize the technology, but the path forward to several applications is much easier than with metal-based approaches." Padilla and his colleagues created their metamaterial with boron-doped silicon—a non-metal. Using computer simulations, they calculated how terahertz waves would interact with cylinders of varying heights and widths. The researchers then manufactured a prototype consisting of hundreds of these optimized cylinders aligned in rows on a flat surface. 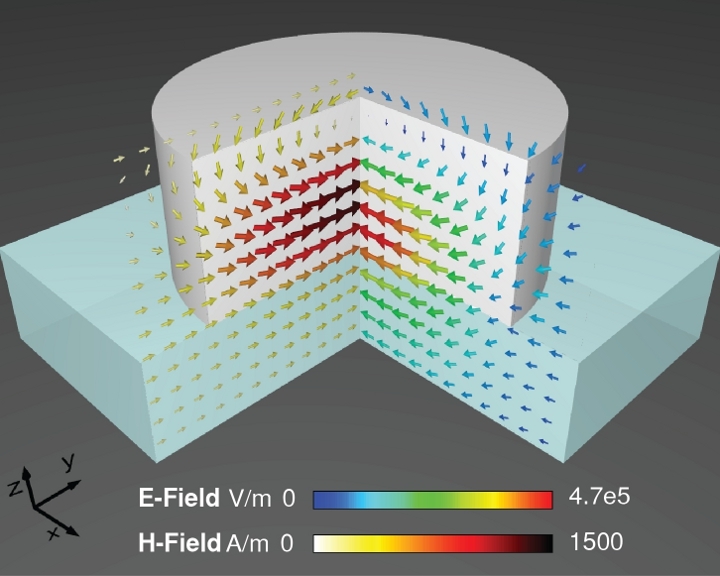 Physical tests showed that the new "metasurface" absorbed 97.5 percent of the energy produced by waves at 1.011 terahertz. Efficiently absorbing energy from electromagnetic waves is an important property for many applications. For example, thermal imaging devices can operate in the terahertz range, but because they have previously included at least some metal, getting sharp images has been challenging. "Heat propagates fast in metals, which is problematic for thermal imagers," said Xinyu Liu, a doctoral student in Padilla's laboratory and first author of the paper. "There are tricks to isolate the metal during fabrication, but that becomes cumbersome and costly." Another potential application for the new technology is efficient lighting. Incandescent light bulbs make light but also create a significant amount of wasted heat. They must operate at high temperatures to produce light—much higher than the melting point of most metals. "We can produce a dielectric metasurface designed to emit light, without producing waste heat," Padilla said. "Although we've already been able to do this with metal-based metamaterials, you need to operate at high temperature for the whole thing to work. Dielectric materials have melting points much higher than metals, and we're now quickly trying to move this technology into the infrared to demonstrate a lighting system." This work was supported by the Department of Energy (DE-SC0014372).